My fave part about spring decorating ideas is that many are so good you’ll use them across summer too. And they’re affordable. I mean, who has the cash to completely overhaul their home every season? And why would you want to? That’s what I’m spilling on in today’s post: budget ways to give your home some stylish vibes for the warmer months. But without having to sell your first-born child to afford it. All of these updates involve smaller bits and pieces. We’re not painting, we’re not buying new furniture. All of your base pieces remain as-is, and we just drizzle on some new decor. Oh, and if you wanna see all of these ideas come to life on film, you can watch the video I created above. Shoutout to Metricon Homes for letting me use one of their gorgeous displays for this shoot. Let’s start in the place I spend most of my time: the living room. I’ve no idea why people say that the kitchen is the hub of the home. My hub is smack bang in front of the TV. Those seasons of America’s Next Top Model aren’t going to watch themselves! OK, so as I said above, this is all about spring decorating ideas without spending a tonne of cash. So all we’re going to do is drizzle across some affordable decor to completely revamp your living room. You got your sofa. Keep it! You got your wall art. Keep it too. And your coffee table is fine. No need to change that either. Let all of those larger pieces in the room stay and simply bring in some new, smaller items. Trust me when I say that the little things can make a big difference. Above I’ve introduced gorgeous teal and charcoal cushions in a velvet finish. I’ve also added in some additional faux fur cushions in mint. I actually got inspired by the artworks that were already on the walls in this room and decked out the sofa in a similar shade. If you love the desert vibes in the artworks above, click here to see more from the desert trend. Pro Tip 1: Look to the artwork in your living room to inspire cushion colours for your sofa. It’ll result in a space that feels cohesive instead of visually jarring. It’s also nice to roll out a new rug with a dazzling pattern on it. In the colder months I like to embrace chunkier muted tones for my living room rug. But when spring and summer hits, I enjoy seeing pattern at play. So above I introduced this rug with a sublime diamond pattern across it. The coffee table also has a few pieces on it that speak to the colour of the cushions and artwork. It’s all about connecting the decor across the room – and colour is the common thread that ties them together! 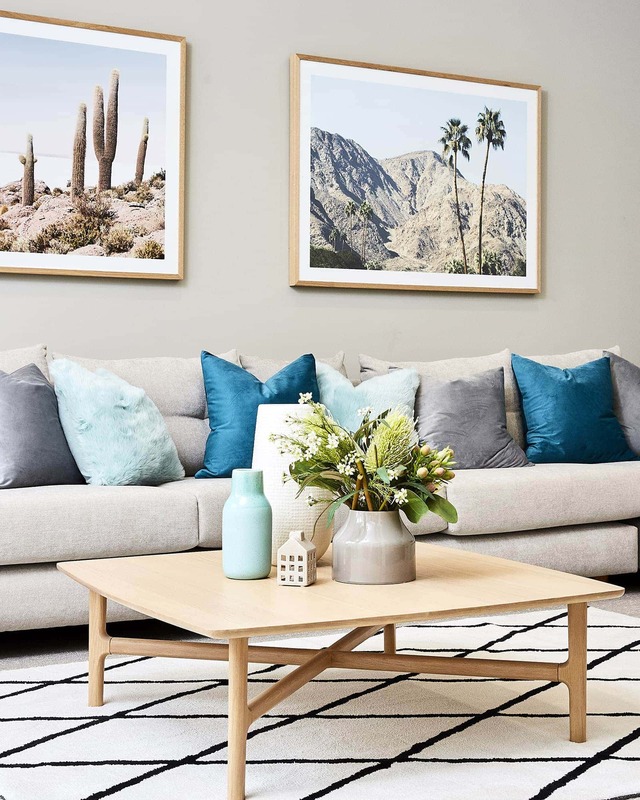 Pro Tip 2: Choose carpet, wall colours, coffee tables and sofas in neutral tones and you’ll be able to update colourful decor more easily as the seasons change. Lorraine Lea stocks a lot of the items in this living room, so I’ll link you to some of them below so you can get these divine beauties in your own home. So that’s the hub of the home taken care of. Let’s move our way into the boudoir. And when spring and summer hit, I like to be unapologetic with colour in the bedroom. As with the living room, my bedroom is often more subdued in the cooler months. I like the whole white, grey, cream and deep blue cosy vibe when it comes to bedding. It evokes a sense of richness and warmth. All of those faux furs and cable knit throws are my bag too. But in spring and summer, splash out on something bold. Rooms can take more colour in the warmer months because you spend more time outdoors. Pro Tip 3: If you find your bold bedding feels too crazy in the space, ground it with some grey tones. They’ll help make the vibrant tones feel less visually overwhelming. Above in this bedroom I brought in a quilt cover set that’s anything but calm. I love the mix of colour here, but I love the brushstrokes even more. Don’t you reckon it looks like a painting? I’m mad for this vibe, and I took it a step further by pairing the quilt cover with a bold blue sheet set. Because, why not!? If you’re going to be unapologetic with colour, take the look to a 10. The decor on the bedside tables is in a colour story taken from tones you see in the quilt cover set. Same goes with the artworks above the bed. By linking all of these colours across different moments in the room, you tie all of them together so it makes sense visually. If the bedding above is making your heart skip a beat, I’ll link you to it below along with a few other pieces from my mates at Lorraine Lea. Bathrooms can be such hard spaces. I don’t mean difficult to be in, I’m talking about materials. There’s obviously a lot of tile and stone and metals and glass. It can all feel quite cold and clinical. It might seem odd to warm up your space in spring and summer, but in the bathroom this approach does work. All of those cold surfaces need some balance and contrast. And if you ask me (which I’m assuming you are), you can’t go past a material like bamboo. You can bring this in through soap dispensers, bath and shower caddies, and floor mats. But honestly, let your imagination run wild here. I also like to soften the space by stacking towels on vanities and beside the bath if you have the space for them. And nothing gets my heart racing like a small round timber stool beside a bath tub. Makes the room feel so organic! Lorraine Lea has a fresh batch of bamboo products for your bathroom, which you can shop here. And if you want to explore their plush-as-ever Cooper Towel range, you can do that here. There are loads of colour options on offer, so you’re going to find one you adore. I’m by no means a foodie or someone who loves to spend hours in the kitchen. But what I do like to spend hours doing is styling up vignettes in this zone. And when spring rolls around, I like to update some of the products on benchtops and on dining tables. You don’t have to labour over this or spend a fortune either. Why not just pick a new colour and bring in some decor in those tones? Above, for example, I went with a moodier blue colour story. I always go toward cooler tones like blue when I’m accessorising, but it’s a great shade for the warmer months too. Pair the blue tones with some equally moody black and charcoal shades, then add in a punch of zesty green, and you’re done. You got yourself a brand new vignette to gaze at every day. Pro Tip 4: Kitchens can be just as cold as bathrooms when it comes to materials. To counteract this, introduce some warm timbers. Serving boards not only look great in a vignette but they’re also practical (and they encourage you to crack out the cheese, which I’m all for!). PS: the flowers above are fake and I adore them. See this post for a list of the best places to get fake flowers and plants from. Lorraine Lea has added some timber moments to their range recently. I’ll link to those below as well as the vases and tea towels you see above. Yes, yes, yes; finally we get a chance to hit our outdoor rooms and give them some decor lovin’. It feels like years since I stepped into my backyard and let the suns rays hit my skin (with sunscreen on, of course!). As with all of the spring decorating ideas I’m sharing here, the outdoor room won’t set you back much money to decorate. The base pieces of furniture you’ve had all year can remain. No need to update your lounge setting, for example. All we’re going to do is spread some affordable decor over the top of it. Also rethink the way you’re using items. Pool towels, for example, can be used as outdoor throws on lounges. And a table runner, normally designated for a dining table, can be used just as successfully on a smaller coffee table. Pop on some serving boards, glassware and bowls, and tea towels, and you’re done. Pro Tip 5: If you have an outdoor room with a roof over it, don’t be afraid to use your indoor cushions outside. I love mixing and matching pieces like this to blur the lines between indoors and out. I am loving all of the outdoor decor pieces from Lorraine Lea this season. I’ll link to the ones in the image above so you can grab the for your space. How are you Decorating for Summer? I’d love to know what colours, patterns and textures you’re brining into your home this season. Drop me a comment below and let me know what your plan is. I’d also love to know if these spring decorating ideas have helped you style up your own home with ease. I’d love to hear from you! I love the colour of the feature wall in the bedroom – what colour/brand? Hi Liz, most items pictured are from Lorraine Lea. Thank you Gavin. Do you know if they are still available?